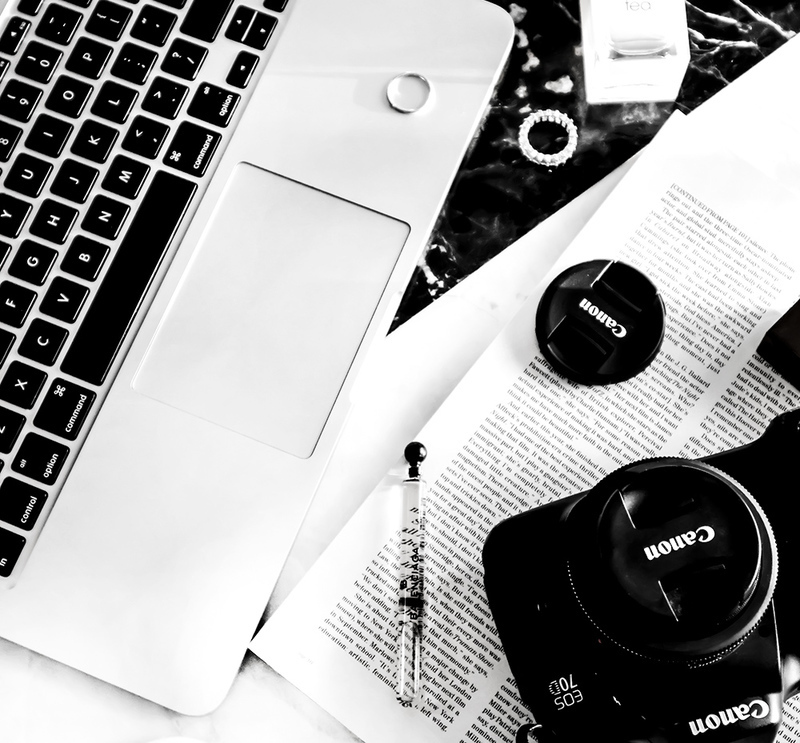 The following content includes referral links and/or PR samples/gifted products (*). Read my disclosure policy for more info. It’s no secret that I have a lot of love for some of those skin-renewing, glow-promising products. Glycolic and lactic acids are among some of my favorite ingredients in skincare and I talk about them only like all.the.time. After going off Accutane my acne is mostly under control but those once-a-month breakouts still happen. Most of the time they’re also followed by hyperpigmentation, and I’m still dealing with some of those lovely, deep/textured scars left behind after nearly 15 years of dealing with acne. I treated myself to a first skin resurfacing laser treatment last month and I’m slowly starting to notice results. 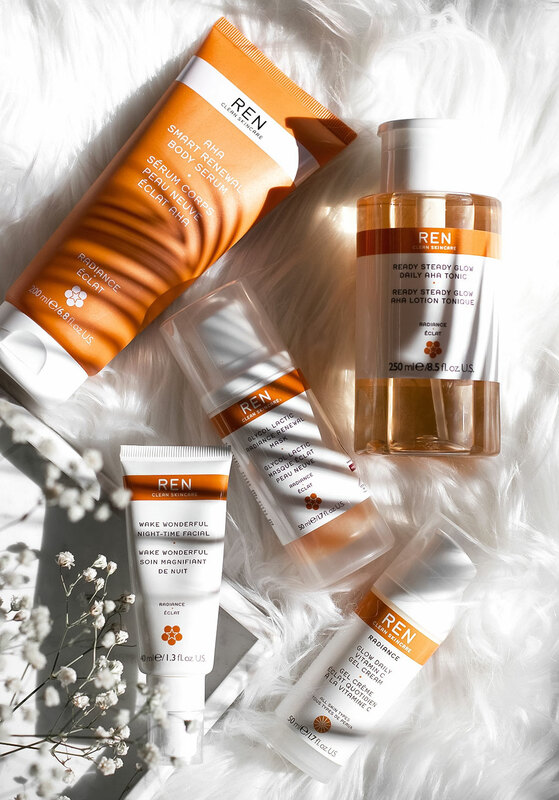 When it comes to hyperpigmentation and smaller texture changes, it’s kind of an ongoing battle and it’s all about skincare here. The minute I get a little lazy with my routine and don’t reach for some of those trusted products, my skin turns dull and sad. A few of those “regulars” that I never go without are from REN, so I thought I’d do a little roundup. 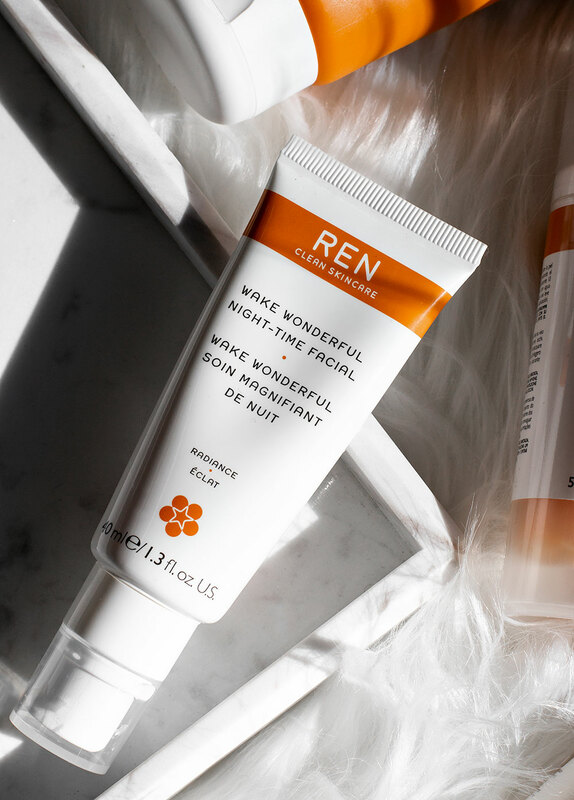 My very first REN product was their Wake Wonderful Night Time Facial. I first tried years ago and it has its own regular spot on my nightstand. This is a nice and quick acid treatment I reach for when I feel too tired (or lazy) for an AHA wash-off mask, but my skin is in need of a little pick-me-up. As with most of my favorite night-time treatments, this is a leave-on product that you wash off in the morning. It gently exfoliates and brightens the skin and I love that it doesn’t feel heavy on the skin. It has glycolic and lactic acids to help renew skin and Arctic Blackcurrant Seed Oil and Omega 3 to help soothe it. The only thing that I’m not too crazy about is the natural citrus scent, but that, thankfully, does not linger at all, so no big deal. 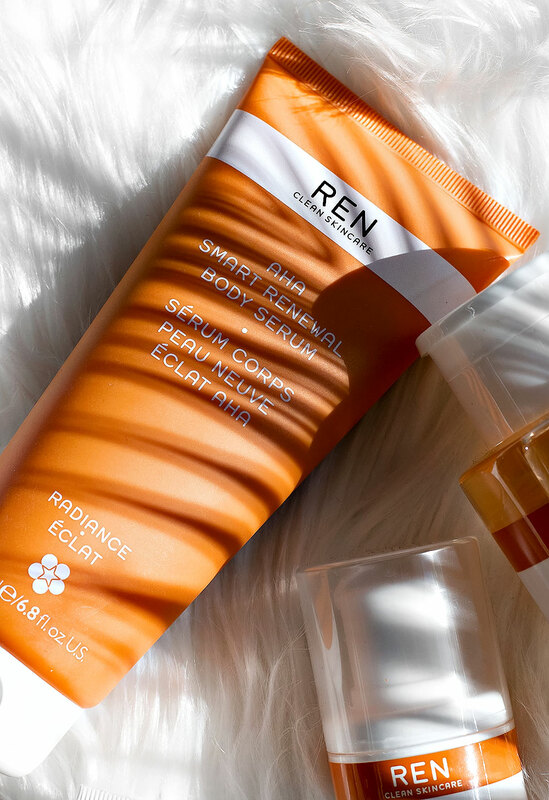 As far as the “cult classic” status goes, REN’s Glycolic Acid Radiance Renewal Mask definitely holds that title. I usually don’t have too much patience when it comes to face masks, but I always find time to use this gem right here. This mask comes in handy specifically when I’m dealing with those hormonal breakouts or congested skin. I’m not too crazy about the sticky texture when it comes to face masks (I find that it takes away from the whole “slap on a face mask a relax” kind of a thing, also, don’t let it get in your hair!) but the smooth and soft skin I get afterward is totally worth it. Even though this might seem like a “quick fix” kind of product, I do get the best results when I use it on a regular basis. 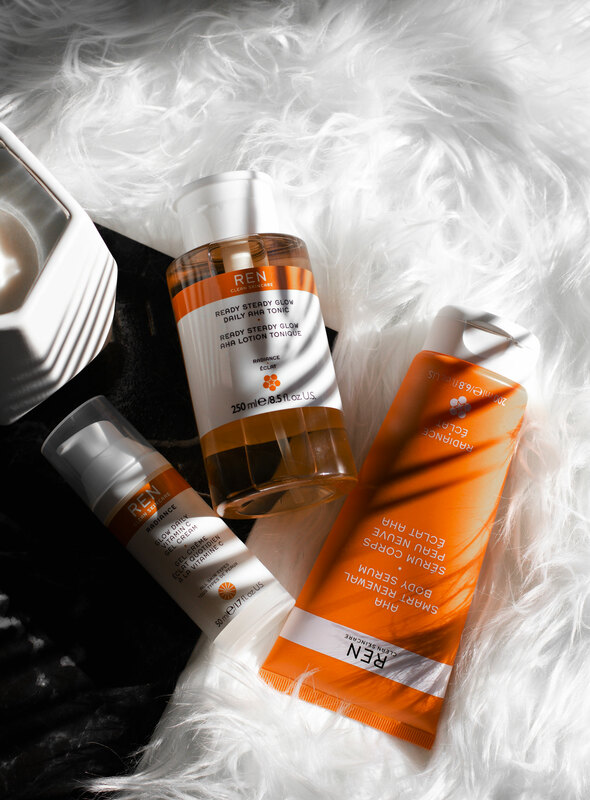 AHA Smart Renewal Body Serum*– I haven’t used a ton of body serums with AHA as Amlactin has been working great for me over the years, but this Smart Renewal Serum has quickly become another favorite. It has a gel-like formula and I feel that with this serum I can get away with using less product. With daily use, I run out of Amlactin pretty quickly whereas the Smart Renewal Serum seems to be lasting me a lot longer despite the tube containing a little less product (7.0oz vs 6.8oz). This lactic acid serum is really amazing at hydrating and exfoliating skin. It does sting a little and feels a bit sticky, but that is to be expected with most AHA products. The good news is that the stickiness doesn’t last as it’s a fast absorbing formula and it leaves the skin feeling incredibly smooth. If you tend to get ingrown hairs, small bumps, dry patches around your elbows and ankles or suffer from KP- this serum can help with them all. I’d really love to see a body cleanser with a similar formula. The fragrance is 100% natural and very delicate. Ready Steady Glow Daily AHA Tonic– I already talked about this toner countless of times, so I’ll keep it short. I’ve gone through so many bottles of this stuff and it’s one of my favorite AHA toners. This daily toner is really good at keeping the skin bright (mostly in terms of acne scarring for me) and smooth (small bumps and stubborn breakouts like sebaceous filaments around my chin and nose). It also has my favorite packaging out of all toning products- the pump makes daily use very easy and convenient. Glow Daily Vitamin C Gel Cream*- for some very strange reason my skin just does not agree with Vitamin C products. I’ve tried countless Vitamin C serums and creams over the years, and every single one of them caused blackheads to appear in places where I normally would never see them- like my forehead, temples, cheeks. After having done some research I actually found that this isn’t too uncommon as some formulas can “sit” in the follicles/pores and cause rapid oxidation of the oils, thus causing blackheads to appear. I’ve given up on trying vitamin C products (slightly paranoid as last time it took me months to recover), so when I received this cream I gave it to my sister. Even though we have very similar skin types (read: acne-prone but also dry) she has no issues with products formulated with Vitamin C. After a couple of week of using the Glow Daily Vitamin C Gel Cream she noticed a lot of improvement in terms of hydration and hyperpigmentation. She is quite picky when it comes to moisturizers and creams, but loved how lightweight and easy to layer with other products this cream was. It should go without saying, but I use sunscreen religiously, and it’s especially important when using any of the above products. Do you guys have any favorites from REN?